On Friday, June 15, President Obama directed federal immigration authorities to follow a new policy of deferred action for undocumented youth who meet the criteria of the DREAM Act. This announcement followed a week in which undocumented activists and allies had shut down Obama’s campaign offices in several states (occupying offices in Denver, Cincinnati, Dearborn, Oakland, and Los Angeles). While most mainstream immigration reform organizations responded with excitement (some even asked their members to thank Obama before he’d made the announcement), the National Immigrant Youth Alliance (NIYA), one of the few organizations actually led by immigrants who would be affected by the new policy, took a more skeptical tone based on the experience of past betrayals. David Bennion, and immigration lawyer who works with NIYA, wrote an excellent pro/con assessment of the new policy on his blog. Below is the press release from NIYA. Check back later this week for a more complete article with thoughts about the new policy and its implications for organizing. 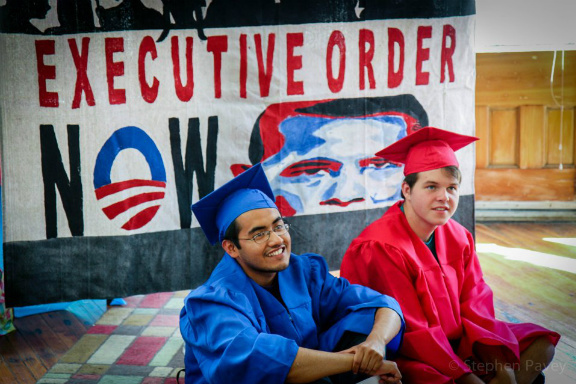 Marco Saavedra and Cruz Bonlarron occupy Obama for America office in Cincinnati, Ohio. Photo credit: Steve Pavey. NATIONAL—In direct response to the actions carried out by the National Immigrant Youth Alliance over the past two weeks, the White House has agreed to provide Deferred Action for undocumented youth. We will confirm the veracity of the claim with our caseload and maintain our present office occupations until any proposed policy change goes into effect. We note that this announcement comes a year after a similar announcement for discretion. Prosecutorial Discretion has yet to be implemented. By regulation, it will take 60 days for this action to go into effect. If it does not go into effect fully after 60 days and provide sufficient protection for undocumented youth, we will resume occupying the offices. We will also have zero tolerance for undocumented youth who enter deportation proceedings in the interim. Over the next several days, we will be checking the status of these cases to confirm that they are being closed and detainees are being released. We will compile the caseload information for media to independently confirm with ICE today. Over the past two weeks, NIYA actions have closed down OFA offices in California, Colorado, Georgia, Michigan, North Carolina and Ohio. Georgia and North Carolina OFA preemptively closed down their offices once they caught wind of the protests. Aside from the occupations, we have generated over 13,000 signatures for an executive order online and in paper. Last week, the American Immigration Lawyers Association released a statement roundly declaring Obama’s signature “achievement” on immigration a “failure.” NIYA has worked on over 60 cases in the last month of people who are eligible for prosecutorial discretion. None have been saved by the policy. Nationally, only one percent of all cases were stopped under prosecutorial discretion. We are pleased to see this administration make progress, but we will not accept the announcement at its word. Prosecutorial discretion turned out to be ineffectual, and essentially a broken promise. We will review the announcement and will not back down until we are certain the commitment is firm. The National Immigrant Youth Alliance is an undocumented youth-led network committed to achieving equality for all undocumented youth. We have member organizations in Alabama, California, Colorado, D.C., Florida, Georgia, Hawaii, Illinois, Kentucky, Louisiana, Michigan, New York, North Carolina, Ohio, Oregon, Pennsylvania, Virginia, and Washington and have relationships with activists throughout the entire country. We are the only independent national organization of undocumented youth. Through advocacy, grassroots organizing, direct action and civil disobedience, we will develop a sustainable movement or justice and equality led by those most affected and supported by committed, conscientious allies.